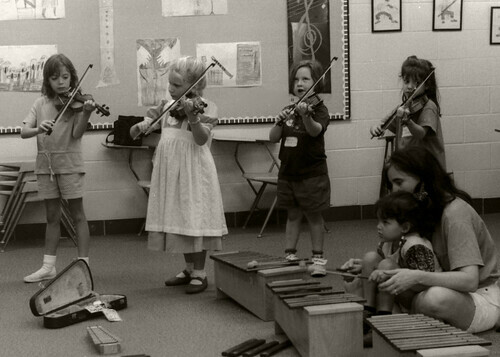 Most kid-quartets are essentially pick-up groups cobbled together by school administrators who are more preoccupied with the logistics of scheduling than with the delicate task of matching up musical personalities. And their job is not easy. There’s a lot of shuffling of cellists and horse-trading of violists (at this age, always the weak link.) Once the ensembles are formed, the commitment from the members, their parents, and the coach is pretty light—an hour or so of rehearsal per week. That is, until midterms, or model U.N, or prom gets in the way, upon which practices may experience a bit of a ritardando for the duration of the academic year. But not always. Every now and then a young quartet really clicks. Once, two sets of sisters met at chamber music camp. They were eleven, twelve, and thirteen years old; two played violin, and there was a violist, and a cellist. Naturally, they decided to form a string quartet. Their parents, delighted by the idea of coordinating rehearsal schedules between only two families instead of four, jumped on board. The parents recruited a coach, a gifted but undervalued faculty member at the school, who took a special interest in the quartet. This coach was not generally assigned to teach advanced players, and the possibilities for educating these four young women unfolded before her like a beautiful, heretofore unstudied map. She stretched out their rehearsal time and taught them tricks of her trade, such as singing their individual lines, and “practicing backwards.” She was creative and theatrical. Her love for the repertoire was infectious, and soon the quartet was practicing together several days a week. As their repertoire grew, their friendship solidified. Opportunities blossomed. The quartet was invited to play all over town. They played for money, and fun. They played on the radio, TV, and internet. They traveled together, to cities around the country. They had pajama sleepovers and all-night talks. Sometimes they were ferried to gigs in limos; sometimes they flew in airplanes. Mostly, they were driven by their parents, who moved hell and high water to get them to rehearsals and performances on time. Everyone was charmed by the story of two sets of sisters: four teen girls, serious musicians but friends foremost. At a competition they were admonished by a judge: your biggest problem is that you blend together too well. Is is possible to blend too well? the girls wondered. The violinists began to question whether their individual voices were being swallowed by the group sound. Over their five years together, they had happily shared first stand. But maybe, as the critic hinted, one of them should have been playing first. Maybe there were other problems. The violist was sometimes unprepared. The cellist was had a tendency to daydream in rehearsal. The girls, now older, anxiously looked forward to college. The violist had tendinitis and a backache. The cellist was changing teachers. The parents were irritable from all the driving. The coach had a headache, and a full schedule of other ensembles nipping at her heels. On the drive home from a performance (unbeknownst to all, their last) in a baroquely adorned, jam-packed hall, one violinist texted the other from her parents’ car: u know we can accomplish so much more—we can win big competitions—if we replace your sister. The violinist was right, of course. Everybody knew that if there were to be a future, they would need a change of personnel. But blood is thicker than water. Who would they be, if not two sets of sisters? The other violinist read the text aloud in her family's car. Her sister, the violist, wept. Their mother gripped the steering wheel. The quartet had been the focal point of their lives for so long that at first no one could believe it was over. The parents, who’d become good friends, stopped speaking. Each pair of sisters found a couple of new partners to finish out their high school quartet years. There was a tug-o-war over the coach as the quartet split, like a paramecium, into two. Their energy divided, both quartets slowed down. Before anyone had time to process what had happened, in the blink of an eye, all four girls had graduated and moved on to different conservatories, except for the violist who, as predicted, did not go forward in music. But not really. After the girls' quartet vanished from her life, the coach went back to teaching ten-year-olds. “Life is a cycle,” she said, philosophically. The parents refocused on their own lives as their daughters receded towards the hazy future. Sometimes the parents meet for coffee. “I miss the old days,” they admit to each other, wondering with a sort of mild nostalgia whether their kids will someday play together again. Except for the violist, probably, yes. The music world is small. As for the girls: the violist often remarks that her training in the chamber music helped pave the way for her success in her new path. As the other three progress in their musical journeys, they drift into and out of quartets and ensembles, searching for a home. It was a good thing, after all, that they were together for so long when they were young. It gave them a taste of what to look for. They’ll recognize the feeling when they find it, that sense of belonging, of blending almost too well. Wonderful post. I am not so sure adult quartets are much different in the ways that count. They come together for reasons which make sense at the time, and, over time, some of them do not work out for musical or other reasons. For the kids, it is a really valuable lesson in what adult life is like in music and elsewhere. I have known of one kid quartet during my life, which included a friend of my son's. The quartet was made up of four members of the same family (interestingly, the parents lacked any significant musical ability). They were very good, and, growing up, gave a number of concerts at the Kennedy Center. As adults, they all continued with music, at least three of them professionally. Several years ago, we saw two of them as adult members of the Jupiter Quartet. I don't know if it's true or not, but it was captivating to read. Of course afterwards I read your bio, violinist, mother of violinists, writer, and then it all made sense.